We’ve got a great round-up of stats to see you into the weekend. It includes news about the power of Instagram, missed email opportunities, luxury adspend, and everyone’s favourite royal couple. Check out the Internet Statistics Compendium for more, and enjoy. According to new research by theEword, longer tweets could lead to greater attention from users. In contrast to the belief that brevity is the key to engagement, the study – which used eye-tracking technology to gauge attention – found that mobile users of Twitter linger for an extra 0.5 seconds if a tweet contains over 140 characters. Similarly, people can spend up to 0.7 seconds longer on tweets if it also contains an image. Despite this news, the report states that there are still far fewer long-form tweets published on Twitter overall, with the majority of users under the (wrong?) impression that shorter is better. Zenith’s latest report predicts that digital advertising will account for 35% of total luxury adspend by 2019. This is largely driven by hospitality brands, as 50% of luxury hospitality advertising will be digital this year - up from 47% in 2017. Elsewhere, Zenith predicts that luxury automobile brands will spend 39% of their ad budgets on digital advertising in 2018, watch & jewellery brands will spend 28%, while fashion & accessory brands will spend just 13%. Lastly, with digital advertising now responsible for almost all the growth in luxury adspend, Zenith has forecast luxury advertising in digital media to grow by $886 million between 2017 and 2019. Ahead of the FA Cup final, Pitchside has revealed that individual players are becoming much more powerful brands than the clubs they play for. In a study of 400 players from the Premier League, the social power of players was found to be an average of 2.38x stronger than their respective clubs. 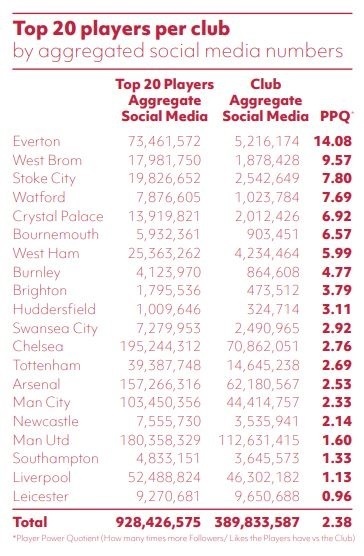 On Instagram, the top 20 Premier League footballers share a combined total of 175m followers - almost three times as many as the top 20 clubs, who share 62.6m. Instagram is clearly the place to be, as the platform continues to draw players away from other social media channels. Just 59% of players now have an official Facebook presence versus 91% on Instagram. Meanwhile, Instagram accounts for over 50% of the total follower base of the younger players, compared with only 38% across all the Premier League players. A new report by Dotmailer – which involves the analysis of 100 retail brands across six sectors in the UK, US, and APAC - has revealed that businesses of all sizes are missing out on potential sales returns, as well as the opportunity to build longer-lasting relationships with customers. It appears this is largely due to failure to implement simple steps in the customer journey. 66% of retailers analysed failed to use any form of audience segmentation, and 56% failed to send abandoned cart emails. Meanwhile, 53% of brands failed to send an aftersales review email, and the average post-purchase evaluation score was 39% for all retail brands, highlighting an overall lacklustre experience. When it comes to data, nine in ten brands scored a meagre 13% for personalisation, and retail brands scored an average of 31% in using customer-behaviour data to drive their strategy. It’s not all doom and gloom, however, as 42% of brands scored 100% for UX - a clear indication that retailers have somewhat refined the user experience. See the study’s top 10 retail brands for email marketing and customer experience below. New search data from Hitwise suggests that excitement about the Royal wedding is reaching fever pitch ahead of the big day this Saturday. In the past four weeks, there has been a 188% increase in searches for ‘royal wedding street parties’, with this being led by Brits in the East of England, predominately women (67% of which are aged 55 and over). The data further reveals 54% of search traffic around the royal wedding is heading to news and media outlets, but another 15% is driving searches to retail sites. In fact, terms with ‘royal wedding’ were searched for nearly 80,000 times on Amazon since the start of May. Meanwhile, research by MyVoucherCodes predicts that Brits are set to splash out £225m in celebration. Based on a survey of over 2,000 UK adults, London was found to be the most patriotic region, with the city predicted to fork out a collective £106 million on food, drink, and other memorabilia. Scotland was found to be the second most patriotic region, ready to spend £29 million. Quintly’s latest report delves into how the UK’s 20 most valuable brands use social media. To do so, it looked at key metrics including follower performance, engagement, and customer service. In terms of the brands that won and lost followers last year, Quintly says Burberry received the highest amount of new followers among all analysed brands on Instagram and Twitter, gaining 2,222,693 and 1,084,240 respectively. However, on Facebook, Marks & Spencer performed remarkably, gaining 463,088 followers in 2017. On the other end of the spectrum is Shell, which lost over 400,000 fans in a single day on 4th April 2017. There was no scandal that could have caused this, so insight suggests that this was due to relocating followers away from a global page to a newly-created regional page. This is backed up by Shell’s high interaction rate. In March, May and December 2017, it received the most interactions, with over 4.4 million on Facebook. When it comes to customer service, Vodafone UK performed the best, answering 3,374 out of the 18,996 questions they received in less than two hours. Three UK comes in second, answering almost 2,841 user requests in under two hours, followed by Sainsbury’s which answered 2,616 questions quickly.